Looking for a little Valentine’s Day fun for the kids? 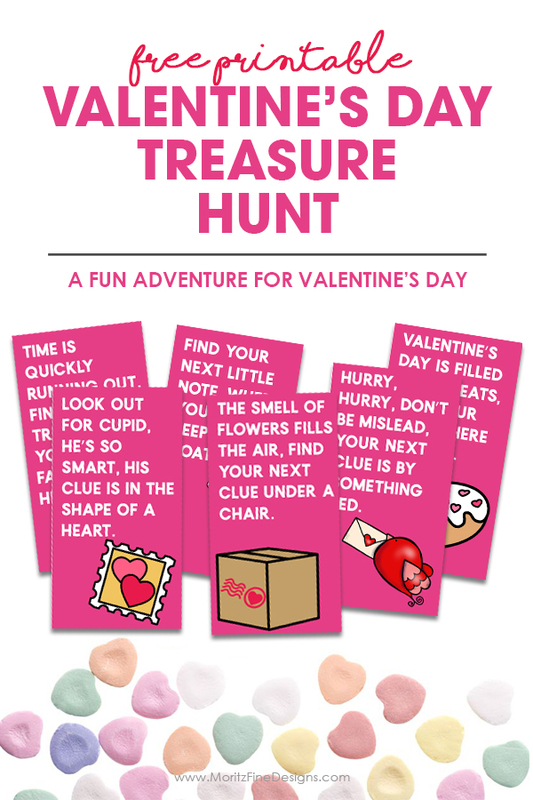 You can send them on a Valentine’s Day Treasure Hunt and the treasure at the end of the hunt can be anything (a small gift or even just a little bag of Valentine’s Day candy) you choose. Sure Valentine’s Day is the perfect time to get our sweetheart a fun gift–but I know most moms and dads love to give their kids a little something fun too. It can be as simple as a chocolate heart box with chocolates or Valetine’s Day Coupon Book for Kids or a small toy! The treasure hunt for kids doesn’t have to just be for kids–you can even use it to hide your spouse’s gift! You will need to be sure to download the treasure hunt cards from the button at the bottom of the post. Be sure to print the clue cards, and then cut out the clues and place one clue in each of the clue locations. The clue locations are listed in the included “answer key”. You will place the “treasure” the kids are looking for in location of the where the last clue is placed. Need to change the Valentine’s Day hunt up a little? Give the kids some other fun Valentine’s Day activities to do! 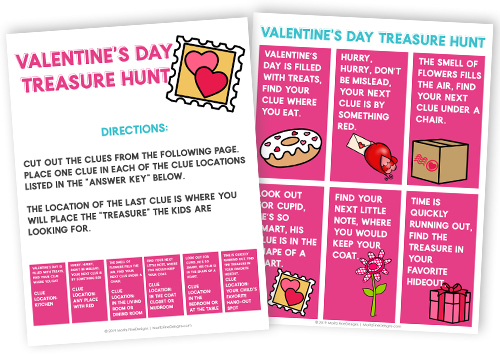 Try the Valentine’s Day Scavenger Hunt or the Valentine’s Day Word Scramble. All of the activities are super fun and free to download and print out! They are sure to be a huge hit with your kids!